Kansans wanted their government to work, and wanted public education adequately funded. A practical approach to state finances and a sense of fairness about who should pay taxes triumphed over a discredited “trickle down” tax cut ideology. Gov. Brownback never repented of the financial mistake that defines his governorship, but finally most Kansans could see that his “sun is shining in Kansas” mantra was false. Certainly, kudos should go to the courageous legislators and legislative leaders who voted to override. Ultimately, though, the real deciders on this issue were Kansans themselves. An override vote that raised taxes and repudiated a governor’s policy agenda could not have happened without strong consent from the populace. Most citizens prefer not to spend their time thinking about budget and tax policy issues. But by the summer of 2016, an overwhelming number of Kansans had tuned in to those issues. They did not like what they saw and definitively expressed themselves in the August primary and November general elections. The 2017 legislative session began with one-third of the seats held by new lawmakers. Polling done mid-session showed that two-thirds of Kansas voters disapproved of the Brownback tax plan. That disapproval tracked across all political ideologies. An even higher percentage of voters expressed concern that the state was not investing enough in education. With those lopsided polling numbers, the die was cast for the override. Kansans had decided. Kansas will be climbing out of the Brownback experiment for years. The override vote did not fix all problems, but at least everyone can take a breath. Our political energy can now focus on the future rather than on crisis management. Our red state status is likely still intact, but the roots of a practical and fair-minded Kansas have started to show through again. Finally, a word to the rest of the nation: We Kansans are “mopping up our mess,” as Senate Majority Leader Denning put it. We’re turning around. Maybe many of you in other states thought we went nuts with our experiment, but keep any smug feelings in check. The whole nation could so easily go down the same rat hole. The Trump tax plan looms. It’s the Kansas experiment on steroids. Pay attention now, or we will all be mopping up something much bigger. A moment of truth for each of you is at hand. President Trump has proposed a tax plan that looks and sounds remarkably like the Brownback experiment now playing out in Kansas. Trump will be asking for your vote — but please consider the experience of your home state before you cast it. Just like the Brownback tax cuts, the Trump plan makes dramatic changes to tax policy by consolidating income tax rates and reworking deductions. 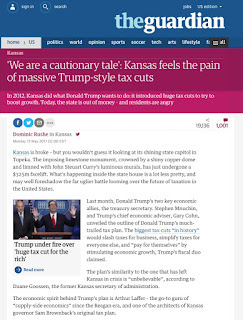 But most notably, the Trump plan offers an enormous tax break to individuals who receive “business pass through income.” In Kansas this feature has become known derogatorily as the LLC loophole, allowing business income to be sheltered from income tax while people who earn a paycheck must pay tax. Given that the same economists who advised Brownback now advise Trump, it’s unsurprising that the Trump administration uses similar arguments to sell its plan: the tax cuts will grow the economy and create millions of jobs; the tax cuts will pay for themselves; everyone will benefit. Brownback said all that, too. But after five years of the Brownback experiment in Kansas, we know the real result. Kansas has an anemic economy and one of the lowest rates of job growth in the nation. A dramatic drop in revenue broke the state budget, wiped out reserves, significantly boosted state debt, and put public education at risk. And that part about everyone benefitting—well, it turns out that the bulk of the tax cut benefits went to the wealthiest Kansans while the tax bill to low-income Kansans actually went up. The idea that tax cuts will “pay for themselves” or that tax cuts for the wealthy will “trickle down” to the middle class should be added to the list of discredited ideas that sound good but don’t work. The sell job at the beginning was oh-so-seductive, but Kansans now have the raw experience to grasp that the experiment carried out on us was a complete failure. 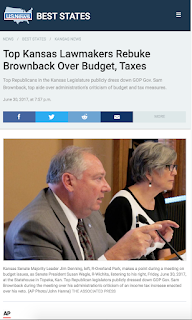 Do you understand how hard Kansas legislators must labor now to fix the financial disaster? Are you catching on that general fund revenue has fallen $1 billion below expenses? Can you see how all political energy goes into crisis management rather than building our future? Is that what you want for the entire country?